I figured it had been way too long since I gave you all a new, affordable wine to try. Not that I haven’t been drinking some great wines recently. Quite the opposite, actually. Since starting at Tar & Roses, I dove into the world of Nebbiolo, Barbaresco, Barbera d’Alba, and Barolo. I have been trying grape varietals I’ve never heard of. It’s exciting, delicious and, oh yea, I’m also learning a ton. And while some of that education has spilled over into my personal wine collection, I’m still always on the prowl for a good deal. Recently I was reminded of one of my favorite bargain wines. Back in my wine-selling days, I sold this wine. And while I was immediately attracted to the beautiful passion fruit flower on the label, it’s a tasty little wine, too. Usually selling for just around $8 a bottle (even at Whole Foods! ), you can absolutely afford to go out and buy a bottle or two. Anyway, Monastrell is the Spanish name for the grape also known as mouvedre, which is perhaps better known as a Rhone varietal mostly used for blending. 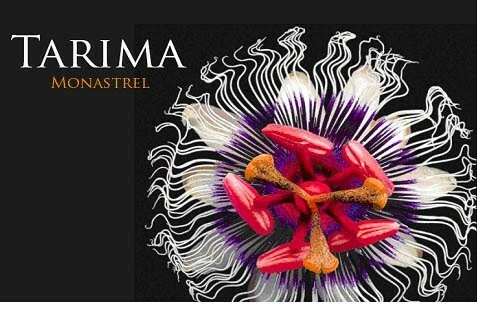 Tarima is a pure expression of the grape at 100% Monastrell. An earthy and spicy wine, expect a fuller body with enough acid to balance it out so it’s not too jammy or fruity. Silky blueberry and blackberry jam on the palate is rounded out with red currant, a nice stony minerality and baking spices. And at $8 a bottle, its unexpected that the finish just goes on and on. If you’re on a budget and you typically choose wine based on the animal or picture on the label, Tarima is a wine that won’t disappoint. And if you’re into scores, Robert Parker’s Wine Advocate gave it 91 Points. Just sayin. I’d suggest drinking it with lamb, rib roasts, tapas, roasted chicken, or as a delicious nightcap after a long day’s work (me tonight). It will also be a nice wine to sip on while watching the Grammys tomorrow (JT is performing!!) or with your Valentine this Thursday. So many excuses to drink an affordable and yummy glass of Tarima!